Three prominent figures who helped make hockey what is in the United States will be inducted into the U.S. Hockey Hall of Fame this fall. 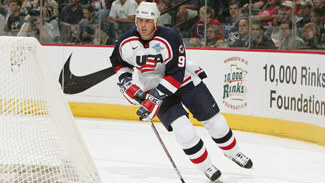 USA Hockey announced Wednesday that Dallas Stars great Mike Modano, former player/current television analyst Ed Olczyk and New Jersey Devils general manager Lou Lamoriello will be its newest inductees. The trio will be enshrined at a location and date to be announced in the near future. "What a remarkable class," said Ron DeGregorio, president of USA Hockey. "The positive impact this group has had on our sport is one that will be felt for decades to come." Modano, the highest-scoring U.S.-born player in NHL history, spent 20 of his 21 seasons with the Minnesota North Stars/Dallas Stars franchise before finishing his career with the Detroit Red Wings. He hung up the blades 10 months ago. The top overall pick in the 1988 NHL Draft, Modano, a native of Livonia, Mich., is the Stars' all-time leader in games played (1,459), goals (557), assists (802) and points (1,359). He also had 145 playoff points in 174 games, each a franchise record. The 42-year-old represented the United States at the Olympics three times and helped his country win a silver medal in 2002. "I never imagined playing for this long and being part of the game for a couple of decades," said Modano, the all-time American leader in goals (561) and points (1,374) who helped the Stars win their only Stanley Cup in 1999. "I think the chase for the Phil Housley record [as U.S. scoring leader] and passing Joey Mullen [as top U.S. goal scorer] were highlights. There are tons and tons of experiences that you could go on for a long time listing." Olczyk was selected by his hometown Chicago Blackhawks with the third pick of the 1984 NHL Draft -- just a few months after representing the United States at the Winter Olympics in Sarajevo -- and broke into the League that fall. He spent 16 seasons in the NHL and won a Stanley Cup with the New York Rangers in 1994. Olczyk had 342 goals and 794 points in 1,031 games with the Blackhawks, Toronto Maple Leafs, Winnipeg Jets, Rangers, Los Angeles Kings and Pittsburgh Penguins. Olczyk, 45, remains heavily involved in the game as a color analyst for the Chicago Blackhawks and the NHL on NBC. His work with the Blackhawks ultimately allowed him to emerge as one of the top television analysts in the sport. "When you work with people like Doc Emrick and Pat Foley on a nightly basis, it makes my life awfully easy," Olczyk said. "They're two of the very best in the game. It's a great thrill every night to sit next to two guys that, in my eyes, are Hall of Famers. The ability to do both sides is certainly a great honor and I thank [Blackhawks president] John McDonough and Sam Flood -- one of the executive producers of NBC Sports -- to sit in that chair each and every night and to be able to talk about the game and to pump our American-born players and to talk about the greatest game in the world each and every night … it's really a thrill. "This is a great day. I'm very proud and I've always tried to represent our game -- whether it be as a player or as a broadcaster -- to the highest and I've always let people know that I was from the great United States. I'm just very humbled and very honored and I'm thankful for the people that helped me along the way, including Mike Modano and Mr. Lamoriello." Lamoriello, who is being honored as a builder, enters three years after being inducted into the Hockey Hall of Fame in Toronto. The 69-year-old is a three-time Stanley Cup winner (1995, 2000, 2003) during his 24 seasons as CEO/president/general manager of the Devils. He was also the architect of the 1996 U.S. squad that won the World Cup of Hockey, a team that included Modano. "That was probably the highlight of a lot of our USA Hockey careers," Modano said of winning the World Cup under Lamoriello's direction. "We felt from that point on, it catapulted USA Hockey to a level that we all hoped and dreamed that it would get to." Lamoriello said, "After the '80 Olympics, the success of that team raised the awareness and stature of American hockey throughout the world to the highest level and it has continued since then to get better and better. "I'd like to congratulate the other members. I have tremendous respect for each and every one of them and I've had the good fortune to work with them." At the college level, Lamoriello helped create Hockey East and spent more than two decades as a player, coach and athletic director at Providence College in his hometown. He was inducted into that school's Hall of Fame in 1982, five years before he headed to New Jersey. Lamoriello's Devils fell two victories shy of winning their fourth championship last month -- New Jersey lost in the Stanley Cup Final to the Los Angeles Kings. It was a surprising postseason run by the Devils, who finished sixth in the Eastern Conference but eliminated the Florida Panthers, Philadelphia Flyers and Rangers en route to their fifth appearance in the Final. "There's no question there's a lot of pride because of the expectations no one had," Lamoriello said of the 2011-12 Devils. "But the internal belief was there once we got to the mid-part of the season. We thought there was a chance. There were some pieces we had to try and find. The players didn't want to let each other down. We just took one game at a time. Getting through Florida and then going through our rivals -- the Flyers and the Rangers -- was certainly something special. We feel very good about those accomplishments, but when you get to that point, you get greedy and you feel that something is still left there. This team deserves a lot of accolades on the way they played."